The coal story | #Hope lives! India has come a long way since 1774 when John Sumner and Suetonius Grant Heatly of the East India Company first commenced commercial exploitation, in the Raniganj Coalfield along the Western bank of Damodar river in Bengal. Today India is the fourth largest coal producer in the world with Coal India Limited being the biggest company in the world, producing around 500 million tons of coal annually. The East India company rejected the coal and continued its dependence on British coal. It is great to see that with the removal of corruption in the coal mining allocation sector, there is a potential windfall awaiting the consumers. 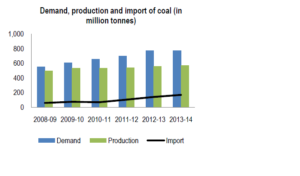 Through the efficient selling off of the coal blocks, to gather immediate revenue, the government has set itself up to substantially reduce coal imports, and costs, in its energy sector. The new policies are bringing greater productivity and transparency. The introduction of modern mining methodology to the huge reserves of Indian coal, and its transportation and logistics, can be a huge boost to Industrial growth. It remains the cheapest form of energy, albeit, at an environmental cost. Carbon emissions will increase in thermal power plants, until less polluting green energy sources or gas from neighboring countries arrives via pipelines, to meet the need of a billion people. In a surprising news Indian ‘Power consumers are likely to gain to the extent of Rs 69,310 crore (693 billion Rupees) from the reduction in electricity tariff enabled by the auction of nine coal blocks to power sector firms so far,’ power ministry said in a statement today in the Economic Times. The Indian coal ministry also informed the production of raw coal in the country during April-November 2016-17 was 391 million tons as compared to 385 MT during the corresponding period of previous year, an overall growth of 1.6 per cent. 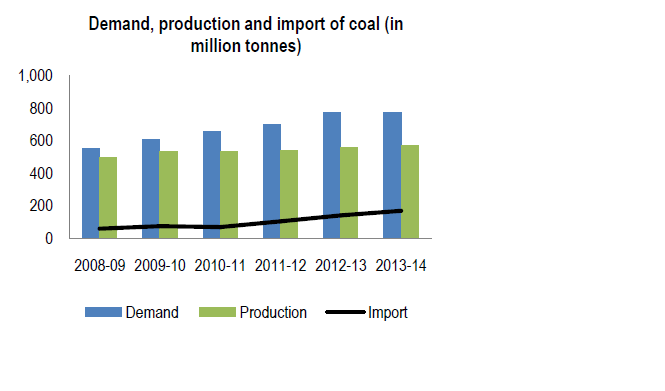 “The coal ministry has given special focus to decrease coal imports. Government has saved about Rs 20,000 crore in the year 2015-16 and about Rs 4,844 crore in the first four months of the current year. The efforts on this front would lead to a further replacement of 15.37 MT of imported coal by March 2017,” the statement said. On another note Rajiv Agarwal, Secretary at Indian Captive Power Producers Association (ICPPA) asked for rationalization of tariffs in the sector. He also said, assuming the government agreed to forego entire tax on coal, the cost of coal will reduce by 50 per cent and the corresponding electricity cost by 40 per cent. This will turn all the discoms profitable. “Prices can be reduced by further 50 per cent if CIL is able to bring its manpower costs to International norms. Power cost will further reduce if costly NTPCBSE 0.50 % purchase pacts are rationalized,” he said. The greatest threat to efficient and stable power and energy distribution in India lies in the hands of undercapitalized discoms who give away free power to large groups of constituents. Pay for use must be instituted as a fixed or metered approach and costs to all the consumers, and only the poorest should be subsidized. India sits on the cusp of an energy revolution as it moves from chronic shortages, to a more stable policy after centuries of inefficiency. Enormous work still has to be done, but as far as I can see carbon energy will continue to grow for decades. Till ambitious plans for nuclear, solar, wind, biogas, hydro, tidal come to fruition, coal remains the king of a dirty heap. As the economic conditions improve, the government has to remove current subsidies to agriculture and other consumers, and come up with a rationalized tariff and subsidy policy, which maximizes revenue, and minimizes hardships for the poor. The coal and thermal energy sector is showing that the more India invests, the higher chances of increasing productivity and growth, in the short to medium term for its people.